India said it had lost one MiG-21 fighter and demanded the immediate and safe return of its pilot. Pakistani PM Imran Khan said the two sides could not afford a miscalculation with the weapons they had. India and Pakistan - both nuclear-armed states - claim all of Kashmir, but control only parts of it. 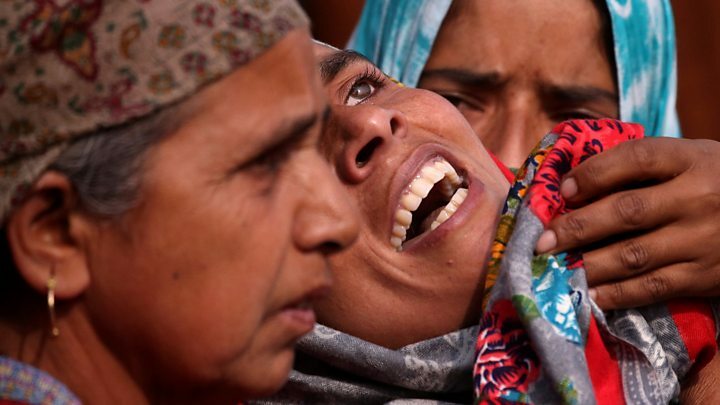 They follow a militant attack in Kashmir which killed at least 40 Indian troops - the deadliest to take place during a three-decade insurgency against Indian rule in Kashmir. A Pakistan-based group said it carried out the attack. Maj Gen Ghafoor said the captured Indian pilot, Wing Commander Abhinandan, was being "treated as per norms of military ethics". Earlier Pakistan's information ministry published but subsequently deleted a video showing the pilot - blindfolded and with blood on his face - identifying himself to soldiers. Another video circulating on social media appeared to show the pilot being beaten by residents in Pakistan-controlled Kashmir before the arrival of Pakistani soldiers. Pakistan's information ministry also tweeted what it said was footage of one of the downed Indian jets. In India, Ministry of External Affairs spokesman Raveesh Kumar acknowledged the loss of a jet and its pilot. India's foreign ministry later issued a statement demanding the release of its fighter pilot and condemning the images shared by Pakistan of Wing Commander Abhinandan, describing them as a "vulgar display of an injured personnel". How are India and Pakistan reacting? In a televised address, Prime Minister Khan offered India talks over terrorism and warned against further escalation. "If we let it happen, it will remain neither in my nor Narendra Modi's control," he said. "Our action is just to let them know that just like they intruded into our territory, we are also capable of going into their territory," he added. Indian Foreign Minister Sushma Swaraj said her country would act "with responsibility and restraint". "India does not wish to see further escalation of the situation," she said, speaking from a meeting with Russian and Chinese foreign ministers in China. What about the earlier air strikes? Pakistan's assertion that it had shot down two Indian aircraft came shortly after Islamabad said its warplanes had struck targets in Indian territory. Indian authorities said the Pakistani jets had been forced to withdraw. Pakistan's military spokesman Maj Gen Ghafoor said jets had "engaged" six targets in Indian territory but then carried out air strikes on "open ground". "We don't want to go on the path of war," he said. India said Tuesday's air strikes on Balakot in north-western Pakistan killed a large number of militants, but Pakistan said there had been no casualties. The US, EU and China have all called for restraint. The challenge for India and Pakistan now is to contain the escalation before things get completely out of control. It is almost unprecedented for two nuclear-armed countries to carry out air strikes into each other's territories. "We are in uncharted waters," Husain Haqqani, the former Pakistani ambassador to the US and adviser to three Pakistani prime ministers, told me late on Tuesday. An Indian defence analyst believes Indian security forces will now have to be prepared for a "full spectrum of conflict". However Daniel Markey from Johns Hopkins University in the US says we are "several steps away" from nuclear escalation. A further escalation, he believes, will happen if Pakistan's "next step were to raise the stakes by hitting Indian civilian targets". Pakistan has closed its entire airspace, its civil aviation authority said. Nine airports in northern India were temporarily closed but have now reopened, reports in India say. The flight monitoring group Flight Radar says international flights have been avoiding the area. Later on Wednesday Thai Airways, which said it was directly affected by the closure of airspace, cancelled all Europe-bound flights and said it had requested permission to use other routes. Other airlines such as British Airways, Air India, Jet Airways, Qatar Airways and Singapore Airlines re-routed flights. Both Indian and Pakistani troops have been shelling across the LoC. Four Pakistani civilians were killed and 10 others were injured in cross-border shelling on Tuesday. On the Indian side, five soldiers were also injured in the firing, officials told the BBC. Schools in at least two districts along the LoC - Rajouri and Poonch - have been closed. 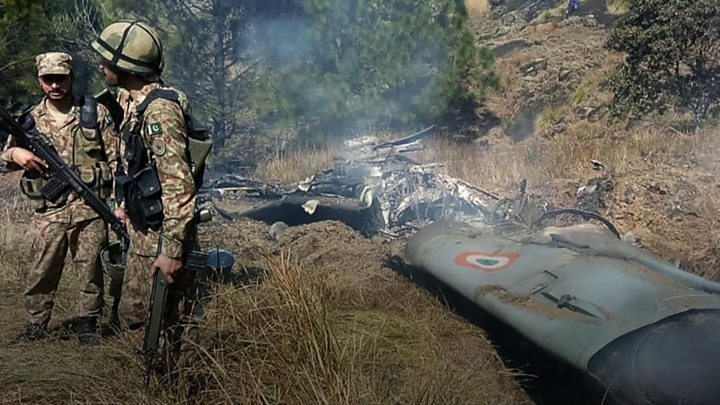 In a separate incident on Wednesday morning, six members of the Indian Air Force were killed when their helicopter crashed in Indian-administered Kashmir. India's defence ministry said the incident occurred during a routine operation and was an accident.